After three cancellations due to the Sewol Ferry disaster, racing returns to the peninsula this weekend. And there is big Stakes action in store as Grand Prix Stakes winner Indie Band finally makes his 2014 debut. Meanwhile at Seoul, the delayed Owners’ Cup will also be run Sunday. Indie Band plays up after winning the President’s Cup. He returns this weekend. Indie Band ended 2013 with back-to-back dominant wins at Seoul in the nation’s two richest and most prestigious races; the President’s Cup and the Grand Prix Stakes. On Sunday, he returns to his home track of Busan to face 9 rivals in what looks a very tough Gukje Sinmun Cup. Aside from Indie Band, Cheonji Bulpae, third in the Grand Prix goes as one of two entrants for Aussie trainer Peter Wolsley, Ghost Whisper being the other. Prolific winner Magic Dancer takes his chance while champion jockey Jo Sung Gon returns from Macau to partner undefeated up-and-comer Strictly Two Step. Oreuse can never be ruled out while Dynamic Jilju and Sand Hi also know where the winning line is. It should be a great race. 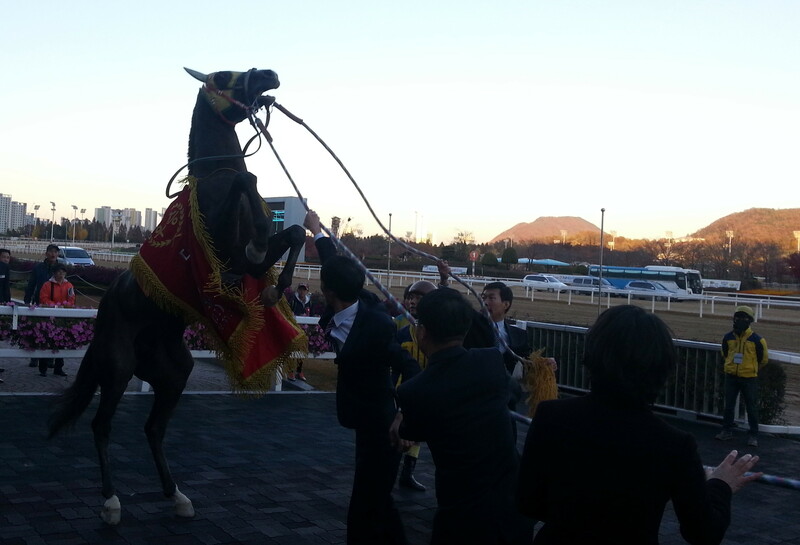 The ferry disaster resulted in the postponement of the Seoul Owners’ Cup two Sundays ago. The race will be run this Sunday instead and 10 of the original 11 entrants will take their chance with only Heukgisa dropping out. Read our original preview here. Busan Race Park: 6 races from 12:45 to 17:00 including the Gukje Sinmun Cup at 16:10.
small field feature race always make me dissapont. I..roughly glaced over this race. Race will unfold too fast for this little girlie. Looks a bit slow..got late speed…?? After lon layoff regaining his usual form. He can handle not only fast pace but off track condition. I predict the track speed approximately 2. Sunday might be more slow,I guess ..
Sunday:It seems to me 11th race more likely to be feature race. Fourteen horses field .class1 7furlong. in their PPs…. ?and what was his or her finished position? This horse gonna be my trio key. Now that blog owner is being absented,I can’t post deep insight analysis. Conclusion:the track was favored to the early speed in most races. deep closer Indiband came in the money…third. My biggest mistake was i didn’t thoroughly check Dynamicjilju could have handled two turn race…. This race unlikely i predicted Ktap got the lead…stupid guys that’s wrong stratedgy….i thought. And Gwanggyobisang roughly 4length behind the leader along the rail. But closer Chunnyondongan and Gwanggyobisang swooped …. I’m not sure you understand well…my english not so good. Mostly broken…haha…but i can read and understand almost all. I ‘m much concerned about Raonmoris..
I’ve got simply not only upon my hunch but also comparing the PPs , this frontrunning boy now under improving and developing much more than Queensblade. raced in KRA CUP MILE,he might come surely in the money.